Many gardeners know the fun of picking their own apples fresh off the tree. Those same gardeners know the hard work it takes to keep apple trees healthy. Disease and insect problems are common when growing apples and constant vigilance is needed to keep them under control. Dormant spray is an important part of keeping insect pests at bay in the home orchard. Dormant sprays are insecticidal sprays applied during plant dormancy in winter. Dormant sprays, or dormant oil sprays, are typically made of refined petroleum. They usually kill insects by smothering them under an oily coating. Sometimes the spray penetrates insect cells, poisoning the creatures. It is important to control scale insects, mites and aphids early in the season. These sucking insects can do considerable damage, especially early in the season. 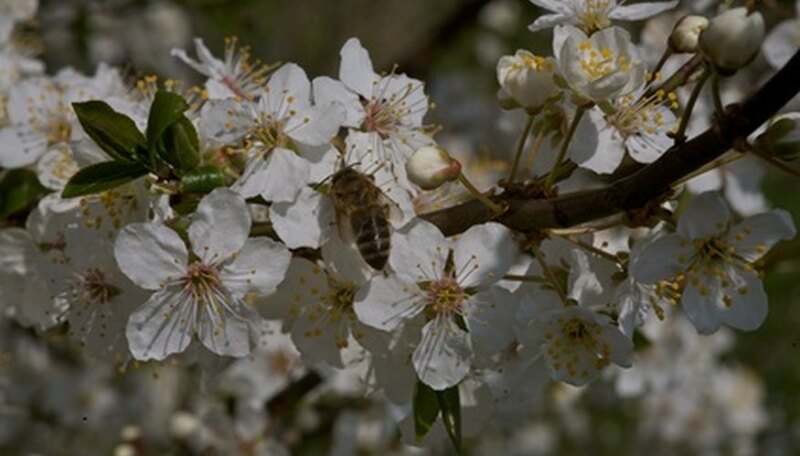 Killing them before they have a chance to feed on the most vulnerable growth, fresh spring growth, ensures healthy buds will have a chance to open up, flower and fruit. Commercial dormant sprays typically contain emulsifiers that allow them to mix with water. The sprays are prepared by mixing the dormant spray with water in a pressurized garden sprayer. Sprays for larger trees are put in a hose end sprayer that automatically mixes the right amount of oil with water as it passes through the container and out of the attached nozzle. Water pressure from the hose allows application of the mixture on out-of-reach branches. Apply dormant sprays in late winter just before the buds break open. Wet the branches and buds on all sides thoroughly. Don't use the sprays once the buds have opened, which can destroy them. Always apply when temperatures are expected to remain above 40 F to avoid the risk of freezing the buds. Always use according to label instructions. Treatment of insect pests on apple trees should not stop after the successful application of dormant sprays. Treat insect problems, as needed, throughout the season with sprays such as malathion or horticultural oils according to product instructions. Illinois Cooperative Extension: Just What is Dormant Oil? Robert Lewis has been writing do-it-yourself and garden-related articles since 2000. He holds a B.A. in history from the University of Maryland and has training experience in finance, garden center retailing and teaching English as a second language. Lewis is an antiques dealer specializing in Chinese and Japanese export porcelain. When to Spray for Worms in Peach Trees? When to Spray Pear Trees?